We Are on a Mission from God - BFL 154BLIND FAITH LIVE ! Real People. Real Miracles. California’s oldest mission and a Dustin Hoffman movie cross paths in this podcast. 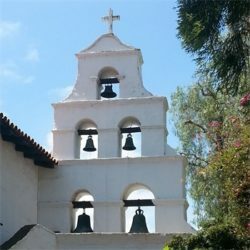 Mission San Diego de Alcalá, the first of a chain of 21 Missions that stretch northward along the coast. Known as the Mother of the Missions, it was founded by newly ordained Saint Junípero Serra, and provides the backdrop for this week’s episode. Philip and Elizabeth Keller travel more California miles than Dustin Hoffman’s 1960’s sojourn to Scarborough Fair. Do you remember the movie? Tess Lashley and Dr. Issam Nemeh team up for a better understanding of what happens at the moment of healing. 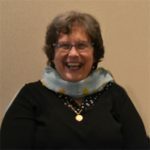 Tess, saddled by pain throughout her body from a variety of ailments, joyfully recounts the moment when her wheelchair became her past method of transportation. Cindy Lauper’s “True Colors” reminds us that God knows us better than we know ourselves. He sees what we are truly capable of and waits for us to show our true colors. This entry was posted in Dr. Issam Nemeh, Episodes, Philip Keller and tagged Chronic Pain, Holy Spirit by Philip Keller. Bookmark the permalink. The reason that I am contacting you today is to thank you for your wonderful podcast. Your show got me through the most difficult experience of my life. It provided guidance for me and I also feel that I received an emotional and spiritual healing through your program. I also wanted to let you know about a miracle that I received after Skyping with Dr. Nemeh on July 3rd, 2015. My husband is an alcoholic. He had been an alcoholic for 30 years. The details of the healing are a bit complicated, but I wanted you to know that he hasn’t had a drink since that day. On the day of the prayer, I really wanted Dr. Nemeh to focus on him, so I didn’t tell him that I had been diagnosed with two slipped discs and arthritis in my spinal cord. Nights were difficult, mornings were painful and it would take me about 20 minutes to fully straighten up. I didn’t ask Dr. Nemeh to pray for me because I was desperate for a miracle for my husband and I wanted him to concentrate on him. Nevertheless, during the prayer, he turned to me and started praying for me. I could feel my stomach being pushed up and in over and over again. From that moment forward I was completely healed. No matter what I lift, what awkward position I take, or how tired I get, I never feel the slightest twinge of ache or pain. I have suffered with back pain for 20 years, so you can only imagine how grateful I am. Thank you Jesus! God bless Philip Keller and Dr. Nemeh and all of their loved ones.